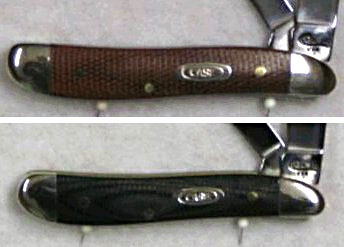 On Case Knives, the first digit of the pattern number indicates the type of material used to make the handle. 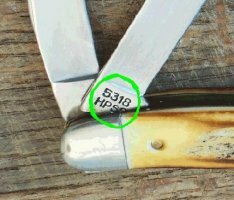 For example: the pattern # 5318 tells you that the knife is made of genuine stag because the # 5 is used by Case to identify genuine stag. There are a hand-full of exceptions. Some material such as appaloosa bone, vintage stag, and others are designated with two digits. 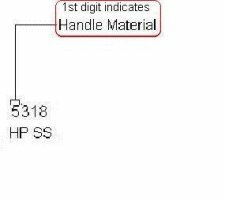 The following is a reference of most of the handle materials used by Case. Walnut handles are most commonly found on cheaper work knives such as the 1199 SH pattern and 12031 electrician’s knife because it is relatively inexpensive to get and make into a knife handle. It is also quite rugged and durable. Case began using this material prior to 1940. It has a smooth texture and most often a glossy shine. Knives made of it are very tough and make excellent work knives. Case created this bright yellow handle material for durability, and unmatched visibility. Knives made from it are almost impossible to loose. White composition is the same material as black composition and yellow composition, but is dyed a cream white rather than black or yellow. Case discontinued it in the mid 70′s. These handles are made from the antlers of deer. It is very popular to collectors because of its beauty, durability, and the fact that no two handles look exactly alike. Over the years its availability has been limited and it has been temporarily discontinued several times. From 1972 to some time in the 1980′s, Case did not use stag for its regular production. It was used sparingly for a few collectors’ sets such as the 1977 blue scroll set, and the 1978 red etched set. Following the 2000 production year, it was limited in its use again for some time because of an embargo on Indian Sambar deer antlers, which were Case’s main supply. Case started making knives from left over stock, and some using antlers from deer found in other regions of the world while supplies were limited. Genuine stag has been used by Case since its early days. The material is cut from the outer part of a deer’s antler. The material is treated by flame to seal the surface. This process gives it a darker more pronounced look. Second cut stag is made from deer antlers. Many collectors say that it is taken from the antler after the first layer has been removed and then jigged. Case’s recent Red Stag is the same as genuine stag except that it is died a red color. 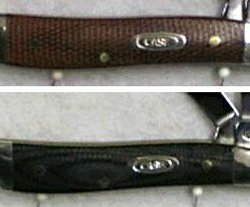 Some red stag Case knives have an R preceding the 5 in the pattern number. Midnight Stag is the same as Genuine Stag except that it is much darker in color. There is often an M preceding the 5 in the pattern number. Vintage Stag Has a V before the 5 in the pattern number. This material is cut from the outer part of a deer antler, and is much like genuine stag, but is not flame treated. Delrin was introduced by Case in 1967. It was created to look like genuine bone, but was cheaper and more durable. Knives made of this material are usually less collectible than bone, and can be hard to tell apart to an untrained eye. (especially since it has the same handle material number as bone). Case started producing delrin handled knives without a circle around the shield in 1975. Before 1975, the shields are the same. Laminated wood handles are made from wood that is layered together and held in form by an adhesive. The wood is then jigged. Case introduced Genuine BoneStag in 2002 as a response to an Indian Sambar stag embargo. It is made from the shin bone of cows, and is jigged and treated with flame to achieve the look of genuine stag antler material. Case uses the number 7 to represent various wooden handles. The first was Curley Maple, but now there are numerous varieties. Some of which include Rosewood and Oak. This material was used by case on knives manufactured prior to 1940. It was intended to look like genuine tortoise shell. 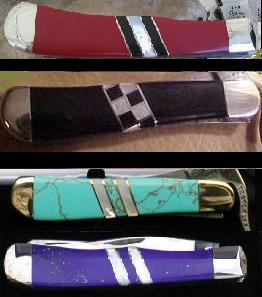 When Case introduced the Sharkstooth pattern knife, they intended to use Curley maple handle material. Because of this, they stamped the blades with a seven. The company ended up using black pakawood. 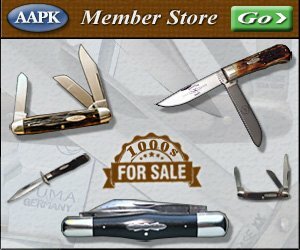 Rather than throwing out the pre stamped blades marked with a seven, Case put them on the Pakawood Sharkstooth knives. All three of these materials are made up of the inner shell of oysters. Small thin pieces of the shells are color matched and bonded together to form large sheets that are later cut and shaped into handles. There is no artificial color or enhancements added. This material comes from mollusks located in the Orient and Australia. At various times in Case’s history, this material has been in short supply. There have been several years that Case did not use the material. Abalone is the same as Genuine Pearl except that it is made from more colorful gastropod shells that come from the waters of California and Mexico. Paua is the same as Abalone except that there are more blues and greens. Imitation Pearl is a Genuine Pearl look alike. It sometimes has a flaked appearance that is often called Cracked Ice. Micarta is a durable and light weight paper or linen based laminante that is bonded together with epoxy resin. It starts as large sheets and is later cut into the desired handle shape. Case has manufactured a few special factory orders, and a limited number of standard issue knives (Lockhorn in particular) using micarta. Appaloosa bone is derived from the shin bone of cows. It is smoothed rather than jigged like most bone handled knives that Case produces. Case first used it in 1979. Imitation Onyx is a material that was created to mimic the color of onyx stone. It was used mostly on knives produced before 1940. Cracked Ice is made from the same material as imitation pearl, but has more of a flaked appearance. Christmas Tree is one of several handle designs made from a celluloid-based material that is impregnated with colors. The design was used mostly on knives manufactured between 1920 to 1945. Case has introduced several knives that have been designated with the letters EX. They are made of handle materials that are considered to be exotic because of their unusual characteristics. 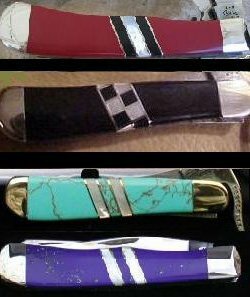 Many are made from materials that are hard to find or are rare in some way.The handles on the left from top to bottom are: Red Coral, Black Jet Stone, Turquoise, and Blue Lapis. This is a celluloid based material that has gold colored flakes mixed in. It was first used on knives produced before 1940. Imitation Ivory is a composite material that looks like natural ivory. This material is derived from the tusks of mammoths that are dug out from ice that is left from the last ice age. The material is over 12,000 years old and very unique. Metal ismostly used on cheaper case lock-back knives. It is usually aluminum and makes for a durable, light weight, corrosion resistant handle. This is a laminated wood. It is impregnated with clear resin and bonded under high pressure for strength and durability. Pakkawood has the natural beauty of finished wood but has a higher resistance to heat and moisture. Candy Stripe is a celluloid-based material that has been colored in a striped pattern. The material was first used on knives manufactured prior to 1940. This is a celluloid-based material that has been colored and impregnated with materials. It was used mostly on knives manufactured prior to 1940. This material is made from the shin bone of cows. It is smoothed and died green. This material is made from the shin bone of cows. It is smoothed and died red. Case introduced Vintage Bone in 2001.